We’ve launched this News section of our website as a way to keep you up-to-date on everything happening with ATD NYC. Chapter is still searching for a President and President-elect. One member is now considering our VP Membership role. You can learn more about these roles here: 2019 Board of Directors Information. If you are interested email contact@atdnyc.org or talk with any Board member. We know the President/President-Elect roles require a significant commitment and the Board is working to shorten the time frame from 3 years to 2. You would serve 6 months as President-Elect, a year as President, and then 6 months as Immediate Past President. That change will require an update of our bylaws so be on the lookout for more information coming soon. There are also several AVP and committee roles available. If you are interested and want to learn more about these opportunities, visit the Volunteer section of our website or contact rosemary.okoiti@atdnyc.org. It’s almost time for the ATD International Conference which is being held in the Washington DC area on May 19-22. Oprah is scheduled to keynote. If you are interested in going or have already signed up, let us know. Once we have 5 attendees, we can form a Chapter Team and that qualifies you for lower rates: $1325 for ATD members and $1625 for those that are members of ATD NYC only. These rates are up to $550 less than the current registration fees ($1875/$2200 respectively). If you’re interested, email us at contact@atdnyc.org. If you've already registered at a higher rate, you’ll qualify for a refund of any amount above the Chapter Team Rates. Let us know. One of our members is interested in participating in a CPLP Study group. If you are interested in helping form a study group, please email contact@atdnyc.org. You can also find study tools in the ATD Store. The Talent Development Book Club is beginning to discuss its 4th selection, The Power of Habit by Charles Duhigg. To stay on track, finish reading chapters 3 and 3 by April 25th. Denis Sternberg of getAbstract has provided us with a summary of the book. You can find it and more information on our website. 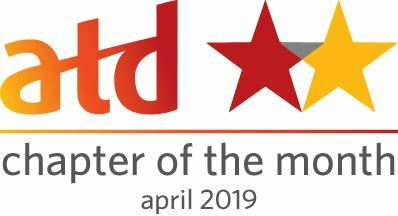 The Chapter just received its Q1 2019 ATD Store report. As you know, our Chapter has a Chapter Incentive Program (Chip) code (CH1026) for any purchases you make through the TD.org website. By using this code, our chapter receives a small percentage of each purchase at no additional cost to you and that percentage varies based on the type of purchase. National memberships, conferences, certifications, books, merchandise, etc. all qualify. In fact, all ATD NYC members can receive a $30 discount on National Membership by using our ChIP code. Thanks to you, in Q1 2019, the Chapter earned $969.50. We want to be able to recognize the accomplishments of our ATD NYC Members. Please email us at contact@atdnyc.org and share your updates with us! April 24 (Tonight): Chapter Webinar: REIMAGINE YOUR DAY, How to Achieve More with Less Stress This session introduces you a practical evidence-based approach to help busy leaders and teams manage their energy and focus throughout the day so they achieve more without the unnecessary stress. April 25: Coaching SIG: Coaching Clinic: What Would You Do??? Join us for a highly experiential evening focusing on real world issues. Please bring a coaching dilemma for discussion about what worked, what didn’t and gain insights on what you could have done differently. April 30: People Science SIG Webinar: Applying a UX Methodology to the Assessment Experience Join Alison Hartmann of IBM as she discusses how a user-centric assessment platform has the potential to enrich your pipeline of candidates, support bias mitigation at the very start of the pipe and enhance our efforts to further your culture of inclusion. May 1: Chapter Event: Learning to Learn! Please join us for an evidence based and interactive session that will explore how to connect the dots from research highlights, explore social experiences that facilitate people’s growth, and discuss practices for managers and teams that create and sustain feedback conversations and learning culture. Visit the Knowledge Center (under Members tab; you WILL need to be logged in) to access the recordings and other information from our events. Join ATD NYC member and ATD National Author, Jack Appleman on April 11thas he talks about Persuasive Writing for L&D and HR Professionals. We welcome your feedback. Contact any Board Member or email contact@atdnyc.org. The ATD International Conference is being held in the Washington DC area on May 19-22. Oprah is scheduled to keynote. If you are interested in going or have already signed up, let us know. Once we have 5 attendees, we can form a Chapter Team and that qualifies you for lower rates: $1325 for ATD members and $1625 for those that are members of ATD NYC only. These rates are up to $500 less than the current registration fees. If you’re interested, email us at contact@atdnyc.org. If you've already registered at a higher rate, you’ll qualify for a refund of any amount above the Chapter Team Rates. Let us know. One of our members is interested in participating in a CPLP Study group. If you are interested in helping form a study group, please email contact@atdnyc.org. The Talent Development Book Club is beginning to discuss its 4th selection, The Power of Habit by Charles Duhigg. Finish reading chapters 1 and 2 by April 18th. Denis Sternberg of getAbstract has provided us with a summary of the book. You can find it and more information on our website. April 17 (Tonight): Experience Virtual Reality at VR WORLD as part of a Special Interest Group social event. If you weren’t able to register for this event, email gabrielle.bayme@atdnyc.orgso we can evaluate the interest in scheduling another event. April 18: Sister Chapter Event: ATD NNJ Spring MeetUp! Join ATD NYC's sister Chapter for member pricing at ATD Northern New Jersey's Spring Networking Meetup! Welcome! We’ve launched this News section of our website as a way to keep you up-to-date on everything happening with ATD NYC. Here’s the latest update from ATD NYC. Chapter is still searching for a President, President-elect, and VP Membership. You can learn more about these roles here: 2019 Board of Directors Information. If you are interested email contact@atdnyc.org or talk with any Board member. We know the President/President-Elect roles require a significant commitment and the Board is working to shorten the time frame from 3 years to 2. You would serve 6 months as President-Elect, a year as President, and then 6 months as Immediate Past President. That change will require an update of our bylaws so be on the lookout for more information coming soon. The ATD International Conference is being held in the Washington DC area on May 19-22. Oprah is scheduled to keynote. If you are interested in going or have already signed up, let us know. Once we have 5 attendees – we are at 3 right now – we can form a Chapter Team and that qualifies you for lower rates: $1325 for ATD members and $1625 for those that members of ATD NYC only. Those rates are over $300 less than the current regular registration fees which go up again on April 12. If you’re interested, email us at contact@atdnyc.org. If you've already registered, you’ll qualify for a refund of any amount above the Chapter Team Rates. Let us know. We learned that our Chapter will now be considered a Large Chapter and have access to more support through ATD. ATD revised its chapter size criteria. Large Chapter status now requires a chapter to consistently maintain a membership average of 300 members or more. We were listed as a Medium-size Chapter under the previous criteria of consistently maintaining a membership average of 350 members or more. We teetered on the edge of Medium and Large Chapter status for months. We were seeing an improvement in our membership numbers, reaching 377 in March, prior to the implementation of the new criteria. 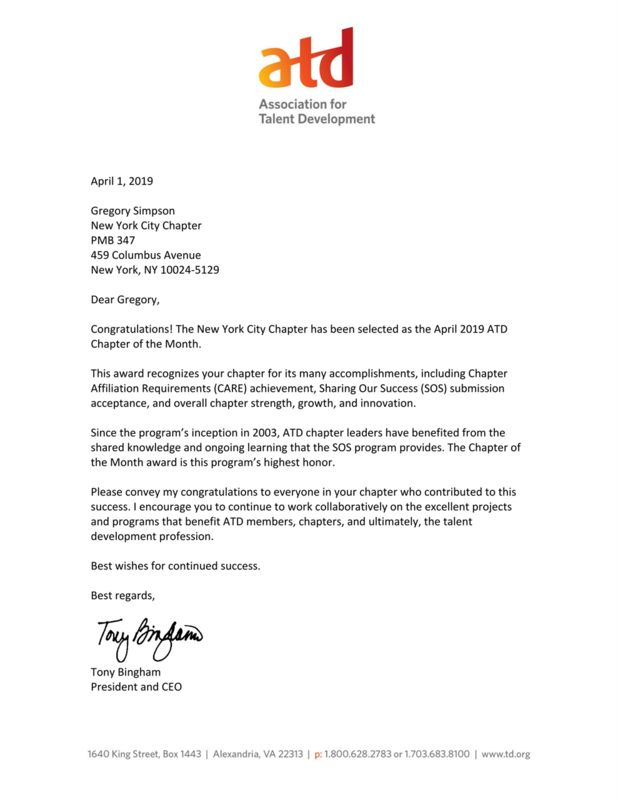 We want to able to recognize the accomplishments of our ATD NYC Members. Please email us at contact@atdnyc.org and share your updates with us! Margaret Clarkson (ATD NYC Past President) is speaking about Talent, Learning & Inclusion at Marsh, while learning from many others about their leadership development programs at the Conference Board Leadership Development Conference on April 9-10. Sy Islam, People Science SIG Co-Lead received the Scientist-Practitioner Presidential Recognition Award from Society for Industrial and Organizational Psychology (SIOP) President Talya Bauer. Zachary Konopka, VP Programs, presented, “The Future of Professional Development is Adaptive Learning” at the 2019 ATD New England Area Conference. Rosemary Okoiti, VP Talent Management, recently earned her Certified Professional in Learning and Performance (CPLP) designation. Join ATD NYC member and ATD National Author, Jack Appleman on April 11th as he talks about Persuasive Writing for L&D and HR Professionals. Experience Virtual Reality at VR WORLD as part of a Special Interest Group social event. Note there is a fee for this event and we’ve reached capacity. Keep checking back in case someone cancels. If you aren’t able to register for this event, email gabrielle.bayme@atdnyc.org so we can evaluate the interest in scheduling another event.